North America Forum»Forum ›League of Angels ›Support › Loralei wardrode bug? 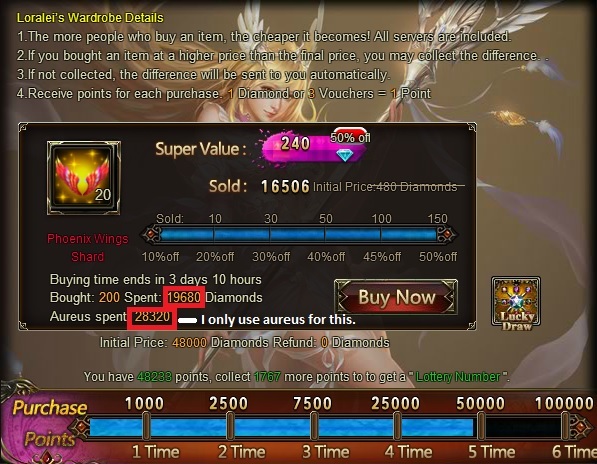 Loralei Wardrobe: Diamond used ...when i bought with only Aureus. I bought Pheonix wings only using Aureus coin I have saved yet it start to collect my diamond also. the numbers of pheonix wings. Please let me know of my report status. Thank you for reporting my issue, Blankz. 2019-4-27 00:22 GMT+8 , Processed in 0.047510 second(s), 40 queries .